Astonishing. Remarkable. Sinister. Those are words that come up again and again when confronting the wave of voter identification laws that has swept through more than 30 Republican-dominated state legislatures in recent years. The measures sound innocuous enough: When a voter shows up to the polls on Election Day, he or she must present valid photo ID in order to cast a ballot. The goal, proponents say, is to combat in-person voter fraud — claiming to be someone you’re not and entering a vote in their name. But study after study, including an exhaustive investigation by the Arizona State University’s Walter Cronkite School of Journalism and Mass Communication, has found almost no evidence that in-person voter fraud occurs. Culling through 5,000 documents over 10 weeks, ASU’s News21 project found only 10 cases of in-person voter fraud since 2000: about one case for every 15 million eligible voters. What’s more, requiring state or federally issued ID at the polls has been repeatedly shown by independent analyses to impose a disproportionate burden on very specific demographics: the poor, elderly, students and people of color. “We’ve heard it time and time again; it really is a solution in search of a problem,” says Stephen Spaulding, Washington, D.C.-based staff counsel for the nonprofit citizen’s lobby group Common Cause. According to figures from the Brennan Center for Justice at New York University, as many as 11 percent of adult U.S. citizens do not have any form of government-issued photo identification, accounting for more than 21 million people. On top of that, the Brennan Center found in its survey that as many as 7 percent of voting-age citizens (more than 13 million adults) don’t have ready access to documents proving that they’re citizens, making the process of getting valid ID all the more complicated. “These ID laws, and this notion that they don’t impose a cost on citizens is farcical,” says Spaulding, with Common Cause. But it’s on that notion that voter ID laws have been ruled constitutional. Indiana’s restrictive voter ID law, which is seen as the test case for similar laws nationwide, was upheld by the United States Supreme Court in 2005 because it was not found to be burdensome to voters. “Clearly that’s not the case,” Spaulding says. It doesn’t take much analysis to figure out the upshot of proliferating voter ID requirements: fewer seniors, students, people of color and low-wage earners at the polls. And it doesn’t take much to see who would most benefit from a whiter, more middle age, affluent electorate. “I don’t think it’s a coincidence that the legislators carrying these bills are not Democrats,” says Lisa Graves, executive director of the nonprofit watchdog group Center for Media and Democracy. According to Graves, whose organization has made voting rights a priority issue, this newest push to limit the right to vote traces its roots to the 1990s and the enactment of the National Voter Registration Act, or “Motor Voter,” under President Bill Clinton. The measure did exactly what its name implies: made it easier for voters to register. African-Americans, particularly, registered in high numbers, Graves says, prompting backlash among conservative states. When Barack Obama won the 2008 presidential election, it was in large part due to huge turnout in cities and among students and African-Americans. Republicans, having lost the White House, sought to shore up their base in the states. According to data compiled by News21, 62 voter ID bills have been introduced in 37 state legislatures since 2009, with the bulk of the measures introduced or adopted in 2011 and 2012 (after the conservative surge in the 2010 midterms). According to the Brennan Center and News21, a handful of states have active, strict photo ID laws for voters and more than a dozen others are pending — either hung up in court, awaiting preclearance from the Department of Justice or too recently enacted to be in effect. Graves, meanwhile, fingers the culprit. ALEC stands for the American Legislative Exchange Council, and if the Supreme Court ruling in Citizens United can be said to have opened the flood gates to corporate cash in American politics, then ALEC is trying to turn on the flood. “ALEC isn’t simply a think tank or a gathering of lawmakers, it is a corporate-funded operation that pushes a corporate message and a conservative message,” says Graves, of the Center for Media and Democracy, which in July 2011 made public 800 internal documents on its website, AlecExposed.org, proving ALEC’s cloaked hand in crafting “model legislation” meant for introduction in statehouses around the country. Registered with the Internal Revenue Service as a 501c3 nonprofit, ALEC boasts around 2,000 member legislators — the vast majority being Republicans — who pay a nominal fee for membership, and upwards of 300 corporate and other private-sector members who pony up between $7,000 and $25,000 for the privilege of getting together with sympathetic lawmakers at lavish retreats. Broken up into task forces focused on various aspects of public policy — from education to law enforcement and the environment — ALEC members, both from the public and private sectors, get together and write model bills which are then voted on and, if ratified, carried home by ALEC legislators for introduction in their respective states. The strategy has been successful. ALEC brags on its website that each year about 1,000 pieces of ALEC-written or ALEC-inspired legislation ends up getting introduced in the states, with an average of 20 percent becoming law. Despite this, and even though the organization has been active for nearly 40 years — it was established in 1973 by arch conservative Paul Weyrich, who also started the Heritage Foundation — ALEC has remained largely under the radar. Nonetheless, its impact on policy in the states reads like a greatest hits compilation of the most controversial bills in recent history: Florida’s “stand your ground” legislation, to state-based efforts against the Affordable Care Act, to limiting teacher union powers and handing portions of student instruction over to for-profit education companies. Even Arizona’s hotly contested immigration law — SB-1070 — started life as a ALEC-approved “model” bill. “There’s a whole set of bills that are advancing that corporate agenda to privatize prisons, privatize education, and by privatize I mean profitize,” says Graves. According to figures from ALEC’s own IRS filings from the past three years, the organization raked in more than $21.6 million from corporations (with members including Exxon Mobil, Altria, GlaxoSmithKline and Pfizer), foundations like none other than the Charles G. Koch Charitable Foundation and nonprofits including the NRA, Goldwater Institute and Family Research Council. In all, private-sector contributions account for nearly 98 percent of ALEC’s funding, while the dues paid by member lawmakers came to just more than $250,000, or about 1 percent of its haul during the same time period. In exchange for these hefty — though tax deductible — donations, ALEC’s private sector members get to ensure that individual pieces of ALEC legislation, by and large, serve a narrow band of very specific corporate interests. More “insidious,” as Graves put it, is ALEC’s drive against voting rights. 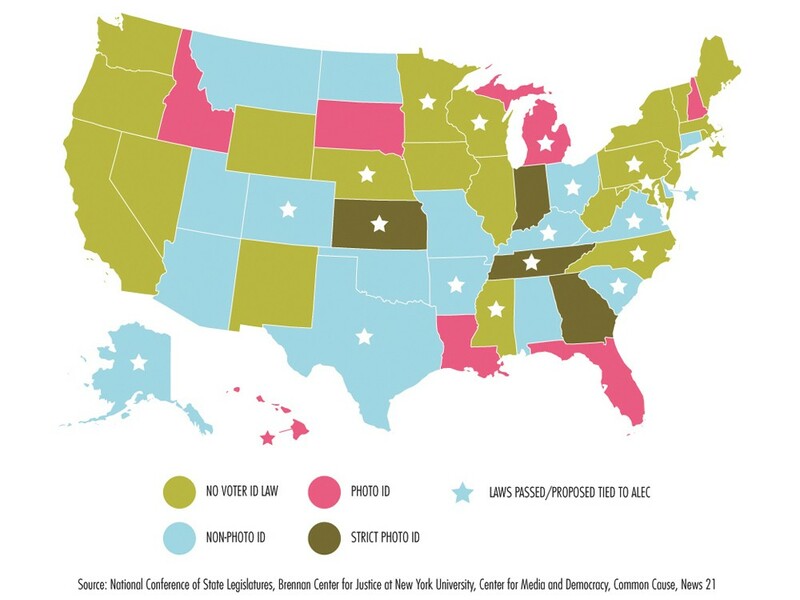 Analysis by News21 found that more than half of the 62 strict ID bills introduced in legislatures since 2009 were based on (or copied from) ALEC’s sample voter ID bill, which was ratified by the group’s membership that same year. These measures serve no particular business master; rather, they strike at the final weapon the public possesses to stem the tide of corporate-crafted legislation: access to the ballot box. As for why big business would support limiting the right to vote: “I think it is a little more class-oriented,” says Alexander Keyssar, professor of history and social policy at the Harvard Kennedy School and a frequent speaker and writer on voting rights issues. With increasing media scrutiny and public outrage, ALEC’s operations — and specifically its voter ID push — may well hurt both its bottom line and the bottom lines of its corporate members. In the wake of the Trayvon Martin shooting in Florida earlier this year, nonprofit civil rights group Color of Change leveled criticism directly at ALEC for crafting the “stand your ground” law, and called on its members to urge corporations to drop their support for ALEC. To date, more than 40 corporate ALEC members have stopped funding the group, including big names like Walmart, Coca Cola, Kraft, Amazon, Johnson & Johnson and General Motors. Losing corporate members and disbanding task forces is one thing, but ALEC may have an even bigger problem on its hands. Common Cause in April filed a whistleblower complaint with the IRS alleging that ALEC’s lobbying activities make it ineligible for 501c3 status. Based on 4,000 pages of internal ALEC documents — some obtained through public records requests and others from inside sources — Common Cause maintains that, “the evidence shows ALEC has an agenda, that they track where their model bills are introduced, that they send out ‘issue alerts,’ which include updates that go to state legislators where ALEC bills or ALEC-related bills are being introduced, sometimes targeting committees or task force members and including talking points, press releases,” says Nick Surgey, Madison, Wisc.-based general counsel for Common Cause. If the IRS agrees, and ALEC is found to be in breach of the rules, the organization would have to reincorporate as a 501c4 and fully report its activities as lobbying. What’s more, Surgey says there’s the possibility that if ALEC is found to have improperly reported to the IRS, tax revenue lost when donations were recorded as tax deductible may be recouped from individual donors — an action that Common Cause included in its complaint. The whistleblower complaint is still working its way through the system, and Surgey says that these kinds of cases tend to take “quite awhile.” Still, he and others, like Graves at the Center for Media and Democracy, maintain that keeping pressure on ALEC is important for more reasons than just recouping tax revenue.